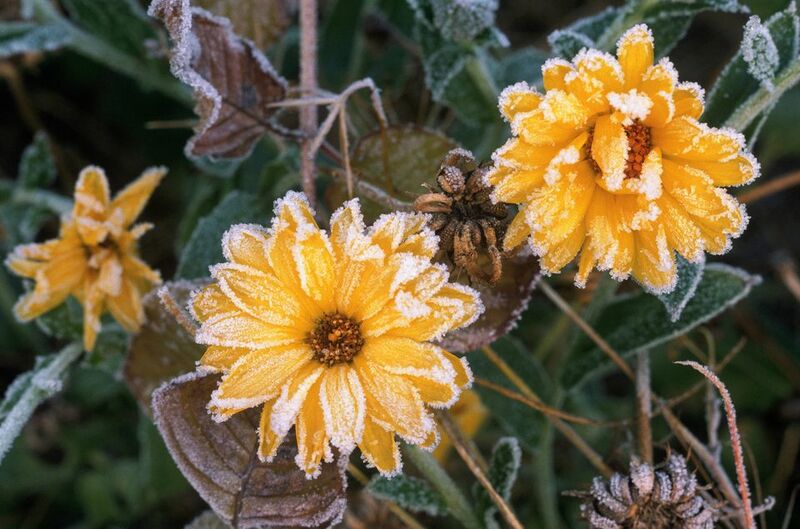 If you have container gardens with tender plants in them, here are a few suggestions for things you can do to protect them from the cold and frost. First thing to do is keep your soil moist. Soil will retain more heat if it isn’t too dry. Also, plants have a better chance of survival if they aren't stressed by drought. You can simply move your container gardens inside at night and out again when the temperatures warm up. I put large containers on wagons and wheel them in and out of the garage - out in the morning on warm days and back in again as the temperatures start to drop in the late afternoon. This is particularly important if you have fruit or vegetables that you want to ripen or herbs that you want to keep going until the last possible moment. At night, soil releases some of the heat that it has collected during the day. To retain this heat and protect your plants from frost, you can invert a bucket or a plastic milk container with the bottom removed over a single plant, or if you have a big enough bucket you can cover an entire container garden this way. Just make sure to put a rock or some other weight on top to keep it from blowing off. For large container gardens that you can't move you can make a tent. To do this create a sturdy frame out of wood, bamboo or PVC piping to place over over the plants. Cover the frame with heavy plastic, fabric or burlap. To retain the most heat, the tent should be close to but not touching the tops of your plants. Also, you'll need to secure the plastic or fabric either by tying it on or weighing down the bottom with rocks. Just make sure to take at least part of the tent off during the day so you don't cook your plants. A cold frame is basically a small greenhouse. It can be as simple as getting some straw bales and placing them so that they make hole big enough to put your container gardens in. You then can cover the hole with a piece of clear plastic, or an old window. A cold frame is also a great way to get a jump on your seed starting in spring. You can buy all sorts of cold frames, from simple to extravagant. Some even featuring automatic opening when the temperatures get too hot. This is perhaps the most stylish option. A cloche is shaped like the bell and is a historic way the cover plants. They are often made of a heavy glass and and can be quite beautiful.